Red Snapper today is so fresh that I can't resist not buying. Hubby is not a fish person, so I bought 1 small one just to satisfy that temptation. 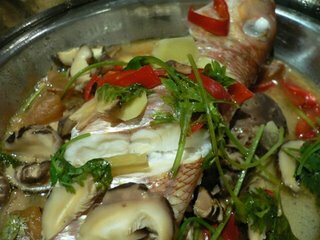 This Red Snapper fish brings back some childhood memories of mine. My late paternal grandparents love eating fishes. Whatever fishes can be found at the wet market, they would buy and cook every week when we visit them. Since we're Teochews, it's definitely steaming it the teochew way. And I must say, the result came back truly delicious. Thank God, papa called me & I got to ask him how to go about steaming it the traditional way. Now, there's another new fish on my list, instead of keep on keeping on buying king fish steaks all the time. 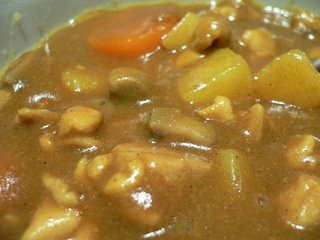 I'm always sceptical about ordering Japanese Curry whenever eating at a Jap restaurant. Probably because of a bad experience that I had b4, the curry I ate was horrible, hence, it stays 4eva in my mind for some reasons.